It’s the holidays, and gifts of technology (namely smartphones) are at the top of everyone’s list. If you’re not planning to give the phone itself, then accessories that allow it to do more, better, faster, are probably a close second. The iPhone changed everything, turning our phones into multi-tasking life organizers that have replaced our cameras, video recorders, alarm clocks and stereo systems. Ruphus, a Portland-based company, is dedicated to squeezing every last drop of performance out of these phones, and they’re doing so in an eco-friendly way that supports the domestic economy. Read on to find out why you should add two of their products—the DockIt and PodPad—to your holiday gift list. I’ve come to expect a lot from the homegrown businesses that hail from Portland, and Ruphus certainly lives up to the reputation. The company is a creative offshoot of the curious minded Raphael Design, an innovative home/interior design/build company that has been at it for 20 years. Now Ruphus is aiming its creativity aimed at smaller, personal, fun and life enhancing gear. With a focus on natural, locally-sourced materials, Ruphus takes the time to create warm, earth-friendly products that add joy to our lives while also meeting a practical need. Take the DockIt, for instance. Devoid of the usual brushed metal and plastics of a typical iPhone dock, this smartphone accessory is thoughtfully made from milled solid bamboo ply. 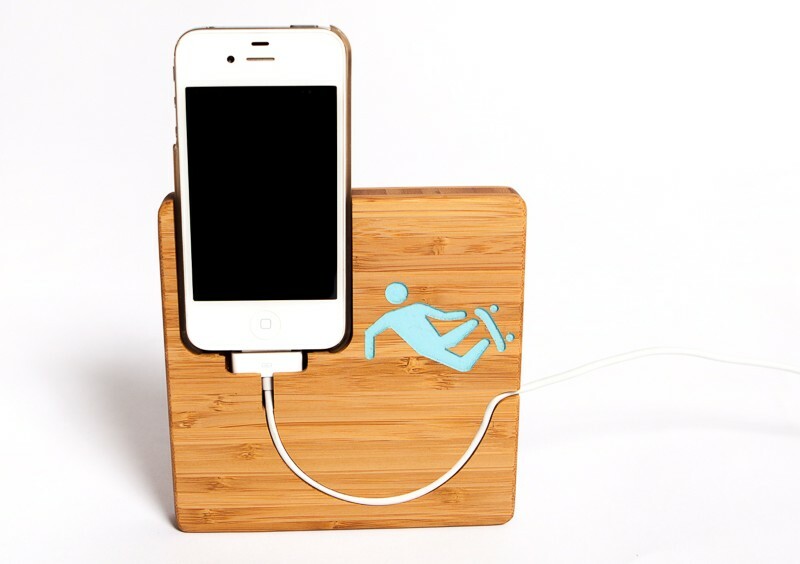 DockIt, which is self-standing or can be hung on the wall, cleverly includes the charger cord as a fun part of the design, and is emblazoned with street sign stick figures busily biking, surfing, skating, and otherwise flying about. Available for iPhone 4/4s + 5/5s. $40. Want to think bigger? As in “my entire house is an iPhone accessory”? Check out the PodPad. Once you see this gorgeous and highly functional hub made of locally salvaged Oregon Black Walnut, you’ll never want to work at a traditional desk again. 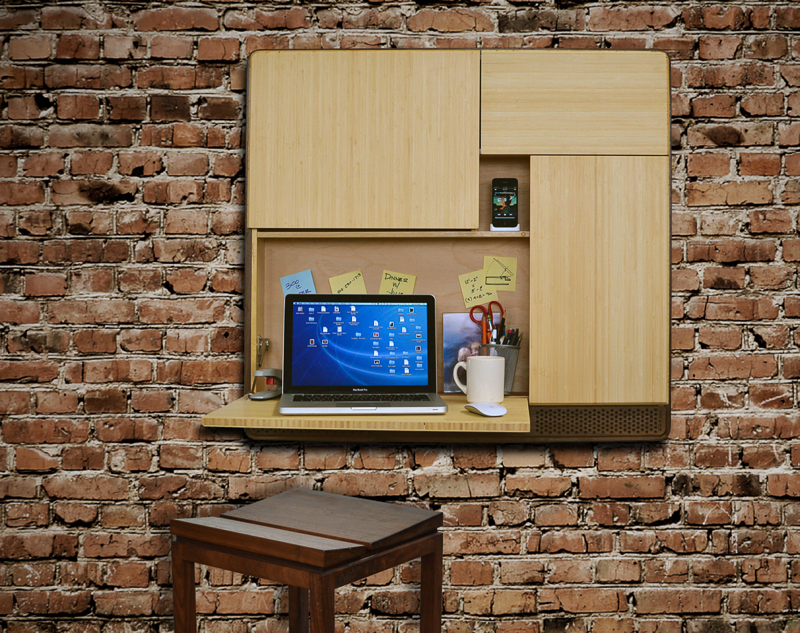 The PodPad features various doors behind which hides space for your office supplies, keys, and even your laptop. An iPhone/iPod fits nicely in the middle of it, with great speakers discreetly built in below. It’s especially perfect for small spaces, because when not in use, it buttons up into a kind of abstract piece of wall art. PodPad measures 38″ x 34 1/8″ x 5 1/8″. Easily mounts on wall with supplied french cleat. $1,200. 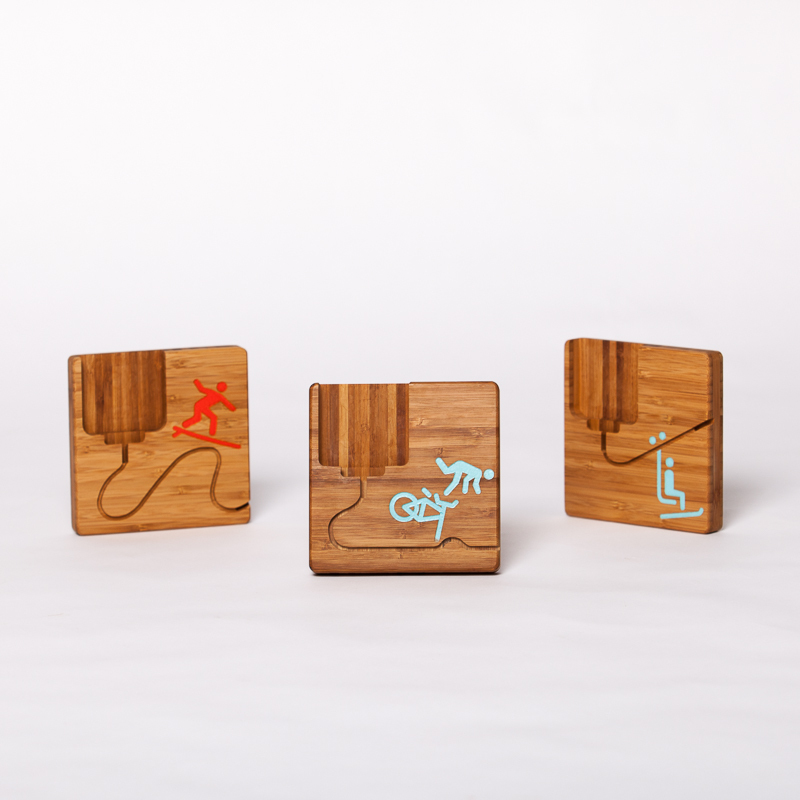 Ruphus is happy to customize any of their current line of products or create something entirely new, perfect for companies in search of unique staff gifts to individuals with an appreciation for innovation. I wonder if that includes an Android version! All images © Ruphus and used with permission. It's the holidays, and gifts of technology (namely smartphones) are at the top of everyone's list. If you're not planning to give the phone itself, then accessories that allow it to do more, better, faster, are probably a close second. The iPhone changed everything, turning our phones into multi-tasking life organizers that have replaced our cameras, video recorders, alarm clocks and stereo systems. Ruphus, a Portland-based company, is dedicated to squeezing every last drop of performance out of these phones, and they're doing so in an eco-friendly way that supports the domestic economy. Read on to find out why you should add two of their products—the DockIt and PodPad—to your holiday gift list.